It’s spring, and time to get the garden growing. We’re hoping for better results than we had last year, but we’re also doing some things a little different. 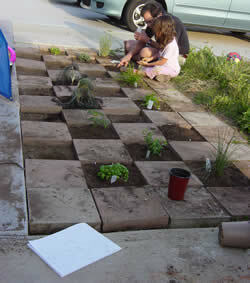 Our front yard has always had a section that was just square stepping stone bricks on the dirt. Didn’t look bad or anything, but kind of boring. Our landlord doesn’t care what we do to the yard, so my husband decided, as you can see in the picture, to take up every other one, and use the area as a garden. No weeds to pull yet that way. The front yard is mostly an herb garden, although there’s one cherry tomato plant in there. We figure the kids play out front enough with friends that they might get a kick out of having little tomatoes to snack on. There are also some decorative grasses that my husband just felt like putting in, some nasturtiums, and we’ll be growing sunflowers out there too. Frankly, the garden looks much better than the rest of the yard, which has been completely overcome by weeds. Some ways I don’t mind the weeds that much; in fact there are a few I wouldn’t mind seeing take over more of the yard. There are some really cute purple flowers in there. But most of the weeds are the usual ugly stuff. Only nice thing about them is that they don’t take much water. My neighbor, a fellow renter, pointed out that our mutual weed problems probably relate to the yard services each of our landlords use. Weed seeds probably get carried in on the lawnmowers. We have different weeds than our neighbors do, so this wouldn’t surprise me. I’d say it would be nice if the yard services would do weed control, but they’d probably use poisons, so… never mind. I’d sooner have the weeds. I may yet pull out the spray bottle of vinegar and give that a go. If my husband does get a good job, I think I will see if he minds having a discussion with the landlord about xeriscaping the front yard. I like the place I’m living in to look nice, but doing the whole front lawn is not an expense I’d really care to deal with, particularly right now. At the same time, if we can get the weeds out of the front lawn that’s fewer weed seeds to spread into the garden. Next comes the main garden in the back. The focus this year is on planting foods that will help with our food bills. I hope things take off this year so that we can really see the effects.